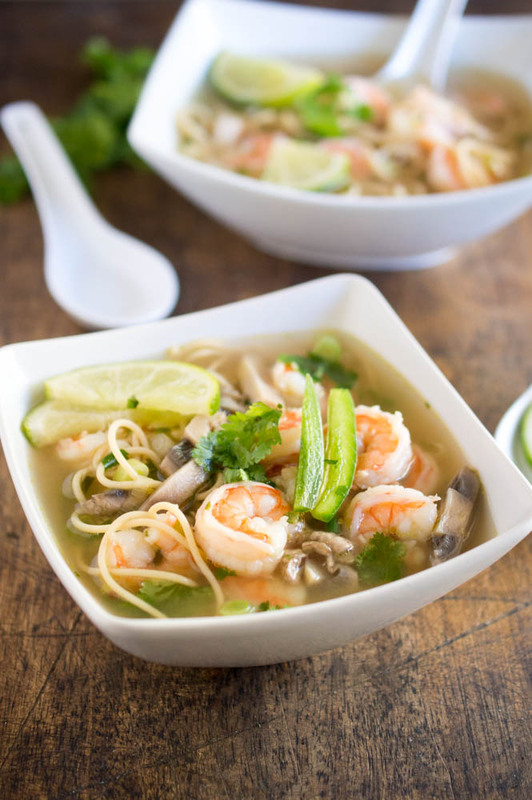 This Spicy Shrimp Pho is a twist on the traditional Vietnamese soup made with hot steaming chicken broth, shrimp, cilantro and fresh squeezed lime juice. There is nothing like a steaming bowl of soup on a cold day. Especially one that is loaded with shrimp and hot steaming spicy broth. Pho (pronounced “fuh”) is a traditional Vietnamese soup made of noodles, thinly sliced beef, and beef stock. I made a twist on the original and used chicken broth and shrimp instead of beef. Typically rice noodles are used in pho. I substituted whole wheat thin spaghetti. Instead of the typical aromatic spices I used cilantro and lime to bring out the lighter flavors of the shrimp. 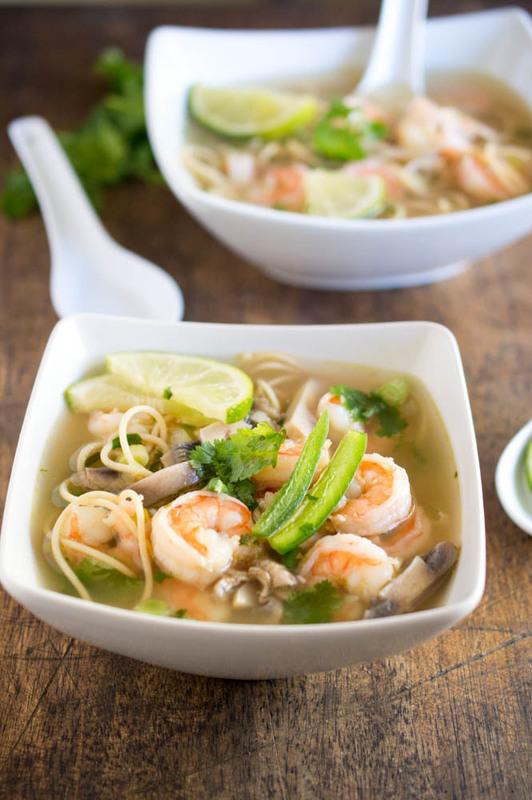 This Shrimp Po soup is warm and comforting. The star of this dish is the broth. So simple yet so flavorful. Pho can be made a number of different ways. Feel free to try this with beef, tofu or even chicken. 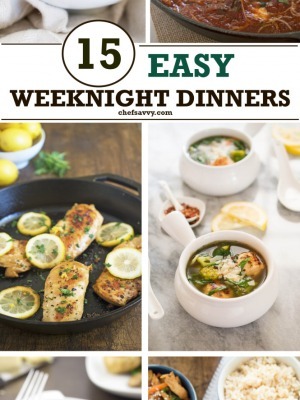 I simplified this recipe to make it an easy 30 minute weeknight dinner. This soup is extremely simple to make. It looks a lot more intimidating than it is. To make this Spicy Shrimp Pho start by sauteing garlic, green onions and jalapeno in a large pot or dutch oven. Add in chicken broth, fish sauce and sesame oil. 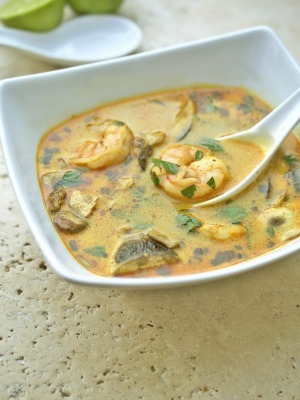 Bring to a simmer and toss in shrimp and mushrooms. Ladle on top of cooked pasta. Garnish with extra jalapeno slices, chopped cilantro and lime wedges. Typically Pho is made at the table with the ingredients placed on top of the broth. I like to make mine up ahead of time and place the noodles in the bottom of the bowl. Looks fresh and delicious Kelley! I love shrimp! Pinned! I ADORE shrimp, I cannot for the life of me remember the last time I had any though 🙁 I must change that with this recipe! I love Pho! This looks so fresh and yummy too. It is extra cold today, and this soup would really hit the spot for dinner tonight! Looks just delicious. I’ve never made Pho before, but sure do love it. Can’t wait to make this! Thanks Natalie! You have to give Pho a try you’ll love it! Love your creative twist on this! I absolutely must try it… sounds warm and inviting… perfect for this cold weather (even here in FL it’s cold). Thank you for sharing! I just made this recipe, added a little powdered madras for an extra kick and used rice noodles – it was fantastic, thanks for sharing! So glad you liked it Rachael! So glad you enjoyed it Tai! So sorry about that! You are going to add the noodles to the bowls and pour the soup on top. I updated this in the recipe. Sorry, I know this is your “take”, but this is not pho. Traditional pho most commonly uses beef broth (though if you have pho ga, it will have chicken broth), and never have I heard of my traditional dish containing shrimp. Also, effectively using spaghetti over rice noodles effective makes it NOT pho. 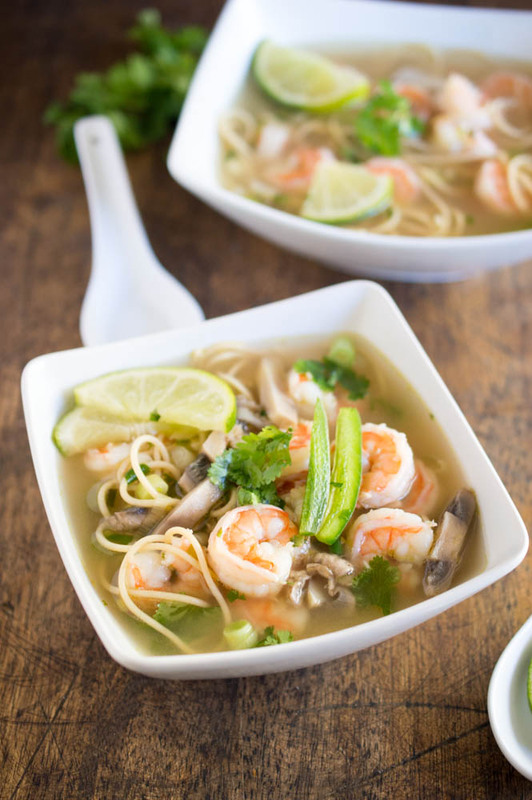 Call it what it is: shrimp noodle soup. 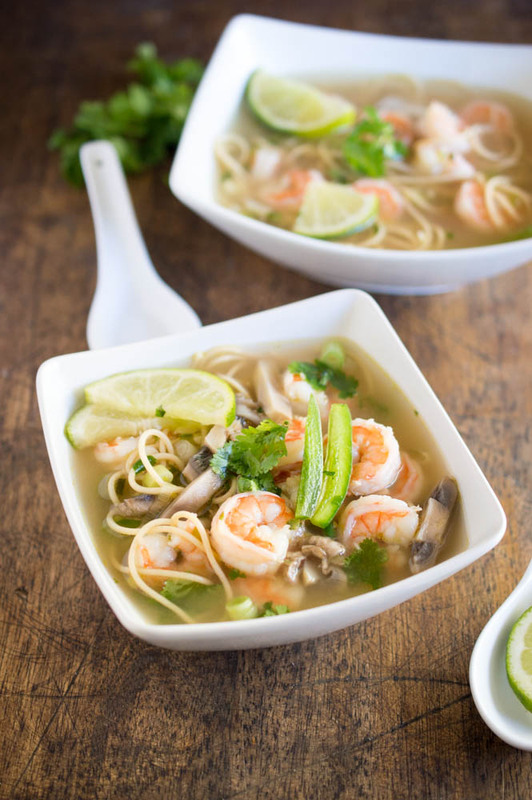 Pho can be made with shrimp but the base of it is cinnamon, anise, coriander seeds, clove, ginger and onion. STFU, she said her take. That doesn’t mean you leave a 1 star and criticize the recipe so bad. Don’t like it, move on. Simple. I’ve been to Vietnam and have had it made with shrimp so that part of you’re argument is worthless. What don’t you people understand that it is her twist on pho. Omg! Get over yourselves!!!!!!! These criticisms are valid. You wouldn’t make fettuccine alfredo and call it a twist on spaghetti. Even though both those dishes are noodles and sauce, they’re not the same dish. Looks good! I wouldn’t call it pho though if it doesn’t use the traditional noodles (banh pho) or traditional broth (nuoc pho). That’s not Phố. Your recipe may be delicious but this has NOTHING to do with Phố and should not be named as such. Exactly. It’s just simply a noodle soup. This looks delicious and simple! But I’d just like to point out, as others in the comment section have, that this isn’t remotely similar to phố. The term phố refers to the noodles used, so even a dish made with the same broth but different noodles shouldn’t be referred to as such. Also, the broth is a completely different take on the traditional way of making things. It’s like making a lettuce wrap and calling it tacos. Though there are similarities, it’s really not the same thing. I’d also like to explain that the reason why people are annoyed with the incorrect labeling of this dish is because it generalizes Vietnamese cuisine, taking away from all the greatness that it is and turning it into something it isn’t. Vietnamese cuisine isn’t just phố! I suggest you explore Vietnamese culture more, and you’ll be surprised by the different flavors and dishes you’ll find. We have many noodle dishes similar to what you made that aren’t phố that I think you’d really enjoy (ex: mì tôm). This looks delicious! I’m about to give it a try right now! Looks like it would taste super good, but this isn’t pho. Whether it was traditional pho or not it was delicious and simple to make. Thanks for posting it! This sounds like a wonderful noodle soup. Please take the advice and rethink next time you name any of your recipes. The ignorance is in the lack of respect for the original, considering it absolutely does not resemble it in any way. A “twist” would be altering it slightly. This, was a completely different soup all together. I love fusion food, but even fusion recipes leave a respectable amount of culture left in their dishes. Might I suggest the name be changed to spicy shrimp faux pho? Used glass noodles. Used two Thai chili’s . Used a pound of shrimp. Added more mushrooms and cilantro than called for. Will add more shrimp and other items. Will add one more Thai chili. Everything turned out wonderful. So glad you liked this Sue! Looks delicious recipe easy to follow…definetly going to try it thanks. Talk about learning the hard way 🤣. Everyone should stop being so critical and enjoy it for what it is. I don’t care what you choose to call it, it is a very tasty dish. Jesus, people, play nice!